(Reuters) - Georgia voters return to the polls on Tuesday to elect a new elections chief in a state where critics accused Republicans this autumn of exploiting the position to suppress minority voting rights. Republican Brad Raffensperger and Democrat John Barrow were forced into a runoff in the secretary of state race after neither candidate secured a majority of the vote in the Nov. 6 general election as required by state law. 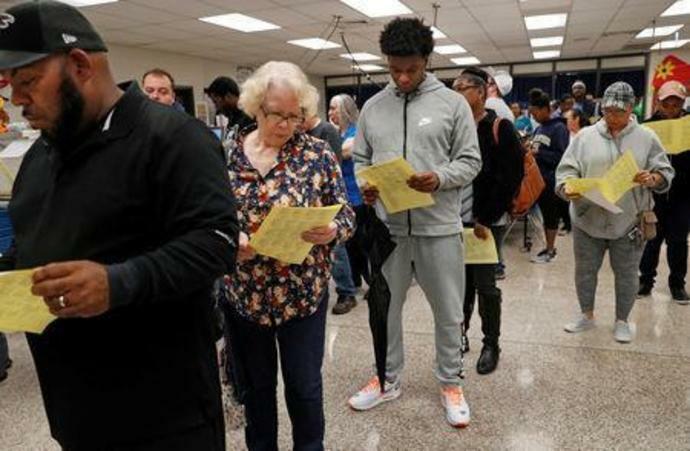 The contest has showcased the partisan divisions still rankling the state after its hard-fought governor's contest, which saw widespread reports of voting problems during an election overseen by the Republican candidate, Brian Kemp, then secretary of state. Kemp's narrow victory over Democrat Stacey Abrams, who sought to become the nation's first female African-American governor, followed complaints of hours-long waits in heavily minority precincts, polling equipment failures and concerns about absentee ballots getting rejected under stringent rules that voters' signatures exactly match the records on file. "It is no secret that Georgia has been a hotbed of voter suppression over the last several years," said Kristen Clarke, president and executive director of the Lawyers' Committee for Civil Rights Under Law, a nonpartisan organization that sued over the state's voting issues. "Whether voters will get a reform-minded chief elections official who can put the state on a different path is key." Kemp has defended the electoral procedures as necessary to maintain the integrity of Georgia's elections. President Donald Trump, who carried Georgia in the 2016 presidential election, has endorsed Raffensperger, a businessman and state legislator who supports voter ID laws and has vowed to update Georgia's voting machines if he wins. In a video on Twitter, Kemp said he voted for him. A diversifying electorate in Georgia could transform the traditionally conservative Southern state into a 2020 presidential battleground. Abrams is rallying her supporters behind the Democratic candidate. In a weekend statement, she said electing Barrow would "protect the sanctity of the vote." After her loss, Abrams created an organization that has filed a federal lawsuit over voting rights issues in her race. Barrow, a U.S. representative for Georgia from 2005 to 2015, pledges to reform the state's process for updating voter rolls to make sure voters are not purged by mistake and touts his bipartisan record in calling for fair elections. Barrow was endorsed by a libertarian third-party candidate who received more than 2 percent of the vote in last month's secretary of state election, which Raffensperger led by a margin of 0.42 percentage point over the Democratic candidate.